We stayed outside most of the afternoon that day, and I got a number of other photos... bet you didn't know that prams are for holding above your head, not pushing along the ground! 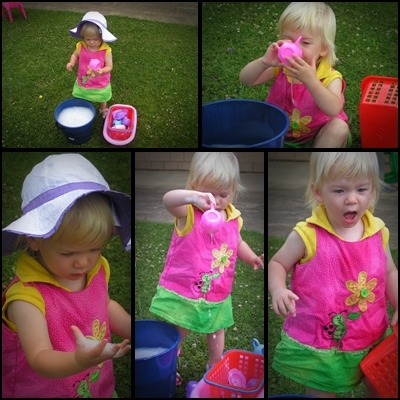 I can't remember what she was pointing to in the second photo, but it is one of those classic toddler shots :-)! At the end of the day she went rather quiet, I had thought she'd gone back outside (I was cooking her dinner by this stage and hubby was home). 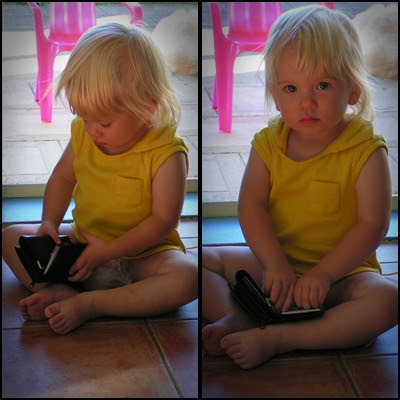 Hubby went to see what she was up to and found her with my wallet - it had been on the table and well out of reach; you can tell in the second photo she knew she wasn't supposed to have it and was waiting to see our reaction! We worked out later (after seeing her try again) that she had climbed up on her pull-a-long dog in order to reach far enough across the table to have picked up the wallet - clever wee cookie! Looks like we are going to have to rethink a few things though ;-)! Left = I learnt how to drink out of the bathroom taps at Playcentre today, what did you learn?!? 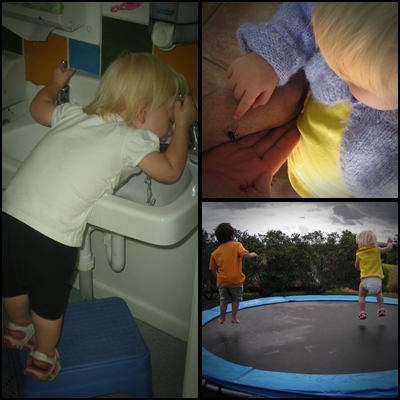 Top Right = A BIG spider Daddy found... Button LOVED it, and was poking and prodding it, even tried to kiss it at one point. Urghhh; I'm glad my fear has not been passed on, but kissing?!? Seriously child!!!! She did NOT need the cardy on in this photo at all, but the latest thing at the end of the day is to go through her jersey's and chose one to put on... she won't take it off for a while, but eventually when she gets too hot she'll allow us to remove it! 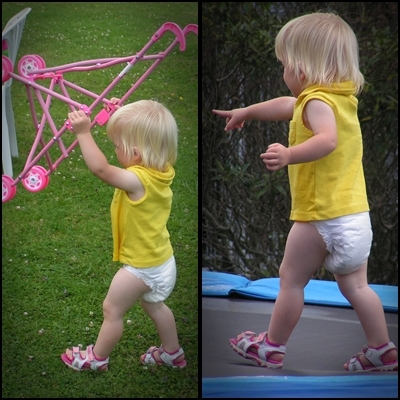 She is learning to take them off herself as well, which is good :-)! I figure it isn't going to hurt her, so while we always tell her it's too hot for a jersey - we let her experiment and put them on anyway. Bottom Right = This is my all-time favourite photo of the day... Reese (neighbours 3.5 year old) had been putting water on the tramp, which had intrigued Button and she'd instantly gone up to jump in it! When there was enough on there, Reese joined her - love how I managed to get them both in the air in this shot, both facing the same direction, and the dark clouds in the background! Trust me though - there were many other shots taken that didn't look this good! I just love the trampoline shot too! Amazing. thanks for the giggles with the spider, the taps and of course the tramp! !